proven and accepted methods of forage analysis. It is strongly suggested that you choose a National Forage Testing Association Certified Lab. Penn State probe will require a brace and bit or an electric drill to use. Both probes collect a good sample and are superior to a grab-sample. Most Extension offices have a probe that you can borrow. 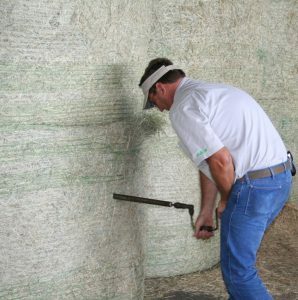 For more information on selecting a forage probe, refer to this article from Dr. Dennis Hancock: http://georgiaforages.caes.uga.edu/content/dam/caes-website/extension-outreach/commodities/forages/docs/faqs/028-FAQ-hayprobe.pdf Forage should be sampled as near to the time of feeding or sale as possible. The most important step in obtaining a meaningful analysis is to collect a representative forage sample. Extreme variation may occur in hay quality even when harvested from the same field. As a result, a separate forage sample should be tested for each hay “lot.” A “lot” refers to a quantity of similar forage. Each cutting should be sampled and marked in storage area where you know which is which. For round bales and baleage select a minimum of 10 – 20 representative bales and collect two cores from the round side of each. Combine the cores in a bucket and mix well. Large round bales should be sampled to the center using a long probe or one with an extension adapter. Angle the probe in an upward direction to reduce the potential for water entering the core holes. In baleage, reseal core hole with tape made for sealing agricultural plastic to prevent spoilage. Regular duct tape is not sufficient and will deteriorate quickly in environmental conditions. For small square bales, select 20 bales and sample from the end at a straight inward line. Place the sample to be tested in plastic zip lock bag and label before taking to Extension office. Bags should be labeled with your name, lot name, date harvested, and species of grass. For more detailed information on collecting a forage sample go to www.foragetesting.org. When the results comes back get with your Extension agent and go over it. They can help you tailor which lot to feed to each class of animal. The cost of the sample is money well spent in balancing your feed needs and will save you money in the end. Posted in Hay. This entry was tagged forage sample, hay, testing. Bookmark the permalink. Next: Should I burn my hayfield?